Now this is really something. 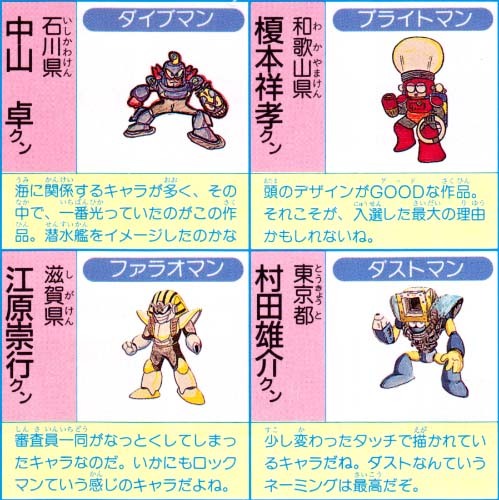 Chris Covell of Your Weekly Famicom - a site set up to translate portions of old Weekly Famitsu issues - translated Capcom's commentary on the eight winning Rockman 4 boss designs. The original artwork of the winning submissions were published, too. I do believe some of these haven't been seen in 26 years! "This one has a slightly unusual touch to its art. Naming the character 'dust', of all things, was brilliant." *Chris' note: "dust" is Japanese English for "garbage", hence all the trash/scrap in the level. I assume the word was made via naïve backformation of "dustbin." Check out all the winning designs and commentary here! These are pretty dang close to what appeared in game. Except Toadman.... he looks more like his Ruby Spears version. Here is where Murata first made history. Very nice find. I have to say the original winning drawing of Pharaoh Man looks really good for something a kid put together in his spare time. Covell also found the prototype for Mega Man: Dr. Wily's Revenge right? I'm really glad to see Chris Covell is still doin' it up Rockman-style. At least, sometimes. I still owe that guy an Astyanax MIDI arrangement, ha hah. "This is the character which all judges considered the best." These judges have good taste. LOL Brightman thinks his Ringman. Not so bright.